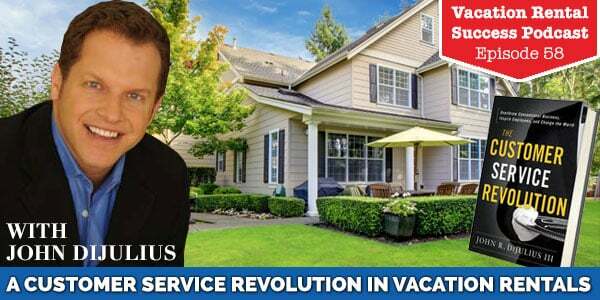 Vacation rentals and customer service go hand-in-hand, and we have it covered– or so we believe. We all like to think we are offering amazing service to our guests – we respond quickly to their inquiries; deliver a beautiful home with lovely décor and comfortable beds, and provide them with comprehensive information on the property and the local area. My guest on the podcast today thinks a little differently. I first came across John DiJulius at the VRMA Conference in San Diego where he delivered the keynote address then followed that with a standing-room only seminar. I was transfixed with his passion, enthusiasm and the take-away information that I applied as soon as I got back to our office. And John’s new book, The Customer Service Revolution, is the required read for all our staff. Although this sounds like it would apply to agencies rather than individual owners, it is just as effective whoever uses it. Instead of rejecting any group based on too many people, pets, etc., offer them an alternative – perhaps another local property you know of that would meet their needs. The book has numerous examples demonstrating how companies have created their “Always” and “Never” lists. John talks about the words we commonly use and gives food for thought when he talks about some of the simple things we see everyday and how they could have a different spin put on them. How often do we see this sign? In our office the word ‘renter’ has been eradicated completely, to be replaced with ‘guest’. We never say, “I’m sorry I can’t help”, instead the phrase is “What can I do to resolve this for you”? I’d never really thought about our rental agreement and how it must sound to a guest until speaking with John about how most seem to be ‘angry’. Once we really looked at ours we began to rewrite the clauses to make them more friendly and welcoming. Of course there still needs to be the ones that tells rather than asks, but even here we could change “Smoking is not permitted in any of our properties” to “ We are pleased to offer smoke-free accommodation”. That is now my go-to argument in favour of ditching damage deposits! I could go on and this post would be epic. John touched on many other things in the podcast so if you have come here before going there, check it out. If you are reading this because you’ve already listened to the podcast and want to win one of the three books I am personally sending out, leave a comment with your best customer service suggestion. I will read them out in a future podcast. John’s book The Customer Service Revolution was released on January 6th and is available at Amazon. We have 2 copies to give away in a draw for the best comments telling us what your customer service tips are. What do you do that shows you are a service revolutionary? Ask the guest what would make them happy. This summer I had a guest complain about an issue that I had no control over whatsoever. However, I wanted to make the guests happy, so I calculated how much of a refund I would offer them and gave her a call. Then, I asked her what would make her happy. She was surprised and asked to call me back after discussing it with her husband. When she called back, she said they didn’t want anything from me, that they were happy that we were aware of it. So I offered dinner on me for their family of 12 for that evening. She declined since they had plans, so I offered to have pizza delivered the next night. She said they would think about it and let me know. The next day, she called to say they were having a great time and plan to do something else for dinner, so it would not be necessary to send the pizza. After her departure, I looked up the highest rated restaurant in her hometown on Yelp and had a gift certificate for dinner sent to her. Wow Tyann – you certainly went the extra mile with these guests! It would have been so easy to let this one go but you persevered and I am sure they are delighted with the level of service you gave. Kudos to you! Our Simply Outstanding Service begins with the initial contact with our “future guests”. Hospitality is a culture within our team and the team consists of everyone who has the potential to affect the guests stay at the cottage: the gardner, handyman, housekeeper, myself and any other service provider relating to our cottage. The best “customer service” tool we have implemented is the use of a guest profile. Each guest is profiled and the information is shared with the team. An example: The gardner receives specifics : children, pets, ages, and additional guests details so he knows when he arrives on property what to expect. I share the “teams” info with guests as well and provide a picture of the team member so if it’s necessary for a service during their stay the guest will be familiar with the service provider. (A “meet our team” email briefly outlining the team members is sent prior to the guest arrival). I’m a firm believer Hospitality begins at home (with the team). When the team is happy it translates to “happy work” which translates to meeting and exceeding guest’s expectations. We all come from a place of “yes” and “how do we get the task accomplished”. Our hospitality culture creates a sense of individual caring for each guest. I firmly believe we have some of the happiest guests on the planet. And as always Heather thank you for yet again another brilliant success contribution! Lot’s of positive reinforcement in this podcast – do the work the results will be worth it! Heather, I loved this podcast. So much of what is discussed is what I try to convey to subscribers. 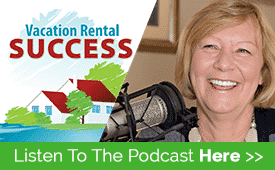 It’s all about the “experience” and not a “rental agreement.” Loved the concept of calling people “guests” instead of “renters.” Thank you so much for the interesting listen this morning! Another great podcast! It’s funny how extreme the spectrum has become when it comes to customer service! I’m sure most of us are already going to great lengths in our customer service after hearing Heathers amazing tips over the years. Yet it’s funny when I go to the grocery store or department store and a young employee barely looks up or even attempts a smile…. Anyway! Off my soapbox now! My customer service suggestion is something Heather has touched on before. It is to become an expert on your area and become a resource for your guests. We make sure to include personal reviews on all of the local restaurants and activities in our cottage guide. Our email correspondence has links to the seasonal activities that they may be interested in, and of course we are ALWAYS happy to respond immediately to emails, texts, and phone calls when looking for suggestions. I’m looking forward to reading the customer service suggestions and I’d love to get a copy of John’s book! Great podcast! Good to know more about the importance of first impressions. I started 2015 welcoming my guests with a cheerful sign with their names. I made magnetic stickers of colorful letters, about 1×1″, one letter per sticker, to form the names of my guests. I place the letters on our VR’s refrigerator, the same place where I post our Wi-Fi password. When I made the stickers, I cut them by hand, so they are not all the same size or overly regular. When I install them, I try not to be too careful, to give the sign a hand-made quality. So far, our guests are loving it. It’s very fast and easy to do, because I only use first names. I have a metallic board where I store the letters in order. 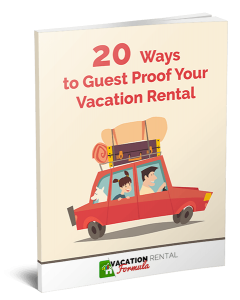 I ask for all my guest’s names as part of the rental agreement weeks/months before they arrive. It takes almost no time to make the signs, and it adds enormous value to our first impression. I made the letters at the company I work. We make commercial signs. If enough people are interested, we could think about offering them for sale to other VR owners. I love that personalisation and I am sure your guests feel special when they see it. It can make such a difference to be recognised and welcomed. This is a great idea!! Hi Dean – Thank you for your contribution. Local information is the best way to stand yourself apart from the competition, particularly recommendations for the best places to eat and visit. It’s tough for someone new to your location to ‘go local’ without this sort of input and I bet they really appreciate it. Thanks for listening Mercedes – it’s always such a pleasure to get your feedback. It’s amazing how a tiny change in the way we use language can have such a difference – we’ve seen a change in the way we communicate with our guests after implementing some of these changes. The concept of ‘team’ is epic Julia and I’m going to implement these ideas with my caretaker, gardener and even the handyman. He is often called in to do some quick repairs or essential maintenance when guests are at the property and I hadn’t really thought of bringing him into the communication mix. Now he is! I love these ideas. I have perhaps listened to this podcast 4 times by now and am about to put it on again. This podcast is one of your best ones, Heather! Our villa is Mais Oui which we pronounce May we, as in “May we help you?” In our minds, the answer is the English translation – “But yes”, or “but of course”! That sums up for us who we are and what we are about. This is such a timely post because we hate having too many rules for our guests but it hurts sometimes to cast a blind eye to some of the things some guests do… like coming in dripping wet from the pool and ruining our furniture. I am going to use these tips as I sit down to redo our house book to make sure any “rules/reminders” are guest friendly. Your post also serves to remind me of all the wonderful people who have stayed with us over the years. Thank you for the comment Sherry and I am super-impressed you have listened to any podcast more than once! Having said that, I did love talking to John – he is so passionate about customer service and I could have talked to him for days. I know what you mean about the occasional things guests do that you wish they wouldn’t but for me it always comes back to the quote about ‘punishing 98% of guests for what 2% might do’. Samuel, what a fabulous idea! wow! That is so thoughtful, Tyann! Great hosting! I try to personalize suggestions based on the guests. For families, I suggest kid friendly activities and family friendly restaurants. For a girls’ weekend I give shopping suggestions. For a men’s weekend I suggest outdoor activities. If someone says they like to cook, I send a few high altitude recipes, because cooking at 9800 feet is very different than cooking at sea level. I would love a copy of John’s book.